You are here: Home » About SolarFlair Energy Inc.
SolarFlair Energy, Inc. was founded with a mission to deliver cost effective clean energy solutions to residential and commercial clients in Massachusetts. With decades of experience in the solar energy industry and electrical power systems, we are well equipped to serve you. SolarFlair brings together an intimate knowledge of solar technology with creative financing mechanisms to deliver a product that will meet your energy goals and save you money. We are committed to your satisfaction. Empower individuals to make a switch to clean energy for powering their home, business, or institution. Reduce our dependence on carbon based fuels such as oil and coal. Provide an opportunity for individuals (employees and customers) that are passionate about these issues to make a tangible impact on the energy usage of the communities in which we live. We are a Massachusetts company, and we know Mass towns, building styles, codes and regulations. 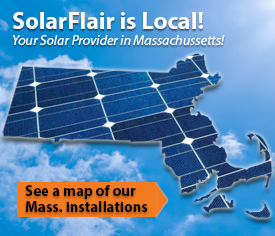 SolarFlair is Massachusetts Leader in Turn-Key Solar Consultation Design, & Installation.